Being Public is an anthology of essays investigating, from different perspectives, the notion of ‘public’. ‘Public’ is one of the most issued categories in current debates on culture, yet the notion itself remains largely un-reflected. The meaning of both ‘art publics’ and ‘public space’ have become complex in a time where boundaries between public and private are shifting, and where ‘the public’ actually comprises different groups of changing composition and identity. What does it mean to be public today? And what is the role of art in constituting both ‘public space’ as well as ‘a public’? Taking these questions as a starting point, the book aims to create a better understanding of the relationships between art and the notion of the public. 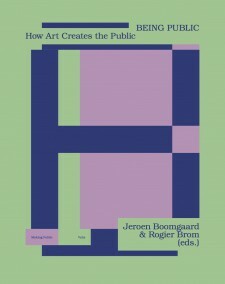 The book Being Public is now available at the online shop op Valiz.